This tweet came across my Twitter timeline a few months back, and I was intrigued. I dug in a bit more and this is what I found! Freeplay Festival is an Australian indie game festival, celebrating games, gamification and a creative industry that works outside boundaries. One of the events at Freeplay 2018 was a video chat between Elie Abraham and Laura E. Hall, both talented creatives and game designers. Their talk, “Get In & Get Out: Escape Rooms” can be watched in full on Youtube. 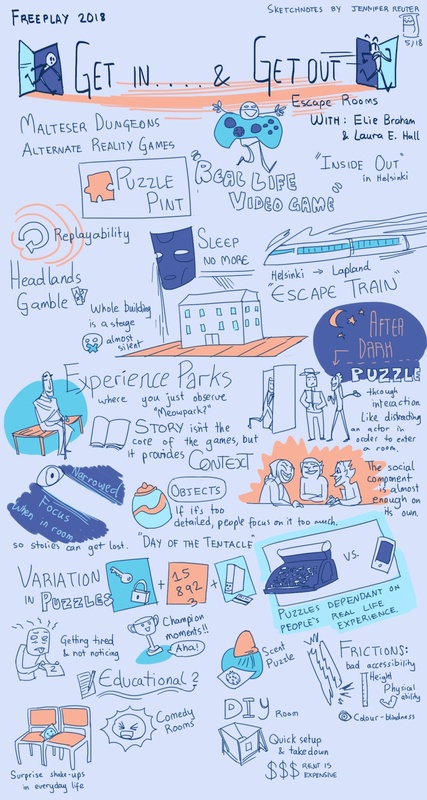 Or, take a look at this incredible visual note-taking form from Jennifer Reuter. I would love to be able to condense my thoughts down into something so creative, but alas I am stuck with my un-edited wordy babble ways. Again, take a look/listen at the chat between these awesome peeps here!